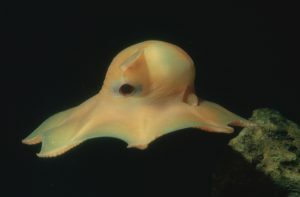 The Flapjack Octopus is a very rarely-observed and less-studied species that belongs to the group of pelagic umbrella octopuses and is a relatively new creature, discovered only in the mid-20th century. 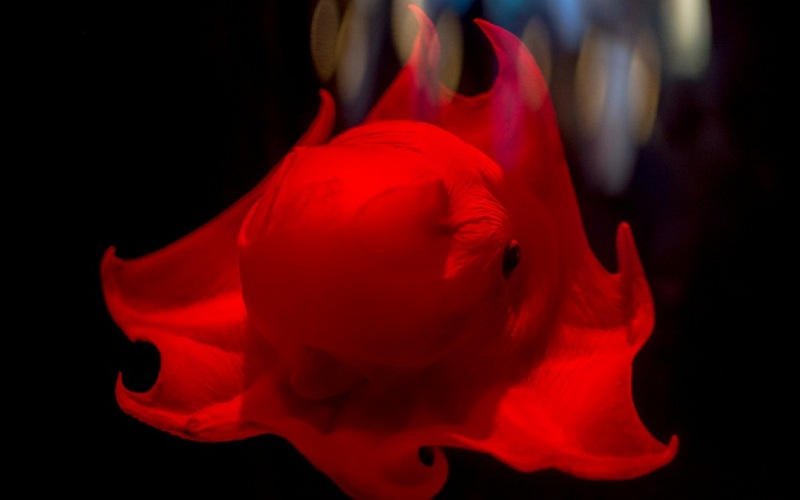 These are small, red octopuses, known for their ‘cute looks’, as they spread into the shape of a red parachute while maneuvering through the water. They are one of the seven members belonging to the genus Opisthoteuthis. Size: The maximum mantle length of this small octopus is 20 cm. Body: The creature is spongy and gelatinous, with a transparent bright red, orange-red or pinkish coloration. Tentacles: The number of legs is usually eight, which are jointed and affixed together in the shape of an umbrella. However, some specimens have been seen to have up to ten tentacles as well. Fins: The fins are in the shape of ears, set on their mantles. Sexual Dimorphism: Not known, except that the males are somewhat larger than their female counterparts. The exact lifetime period of the species is yet not known, however, the estimated embryonic development time range is between 1.4 years and 2.6 years, from which their minimum longevity can be assumed. They have been located around the Eureka Bar in California at 350 m depths. Also found in Japan at 530–560 m off Kashima-Nada, the Bering Sea to the Sea of Okhotsk, to central Honshū in the northwestern regions of the Pacific Ocean, to southern parts of California in the northeastern parts of the Pacific. However, most specimens live off the coasts of Japan and California. The average depth range of the para-larvae is 200 m, while for the matured adults, it is 500-1500 m.
The species have not been classified as yet. Little is known about this species since very few specimens of these octopuses have been captured till date. Like many other opisthoteuthid species, they are found within the boundaries of the waters targeted by the modern-day fisheries. These mollusks move by swimming, moving the fins, as well as pulsing their small webbed arms. In order to move, they might also push the water by creating jet propulsion through their funnel at times. However, they can even use all the above three procedures at once. While hunting or foraging for food, they usually pounce of their prey and kill them with their beaks. Flapjack octopuses normally feed on small fish, planktons and other crustaceans. Like most other members of its class Cephalopoda, these are gonochoric – with the male and the female being distinctly different from each other. 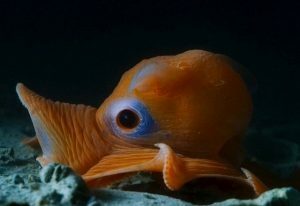 While the adult male flapjack octopuses normally die soon after spawning, the female flapjack octopuses would wait until brooding. Prior to mating, the males of the species have been seen performing various kinds of sexual rituals, which they display to attract potential females in order to copulate. During the process of mating, the male flapjack would grasp the female by its body, and inserting its hectocotylus (a modified arm used by male octopuses, as also some other cephalopods, to transfer sperm to the female’s body) into the mantle cavity (the central feature of a mollusk), where the fertilization in the females usually occurs. A mature female can produce anything between 225-475 eggs. The embryos are hatched out into a planktonic stage. The baby or juvenile octopuses continue to live with the female for a very short time before they grow up large, and eventually, take up a benthic existence to live as independent adults. The eyes of the flapjack octopus is round, prominent and bovine-like, while their fins are ear-like. This gives the entire creature the shape of a staring face, enough to startle its enemies, especially the chance predators. They can flatten down at any time to look like a flapjack, thus appearing less threatening to their prey. The very size of these octopuses helps them quickly hide inside crevices or under rocks, if attacked. No direct evidence of specific predators has yet been recorded. However, it is thought that a wide variety of fishes, larger arthropods and mollusks prey upon this little creature. The official conservation status of this species has been marked as ‘Data Deficient’ by the IUCN 3.1 since there is no estimated population count. 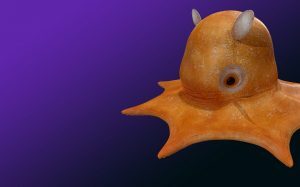 The flapjack octopus has been the inspiration of many kid-related themes, including sketchbooks, soft toys, cookies, and so on. The flapjack octopus has been made famous as Pearl, a cute-looking pink octopus, in the famous 2003 Hollywood animation movie Finding Nemo. Of any cephalopod, this species is the most compressed in the anterior-posterior axis. The species belongs to the genus Opisthoteuthis, the members of which are collectively known as the ‘flapjack devilfishes’. At times, it is affetionately addressed to as the ‘ghost octopus’ for its appearance like a moving ghost covered in a mantle. 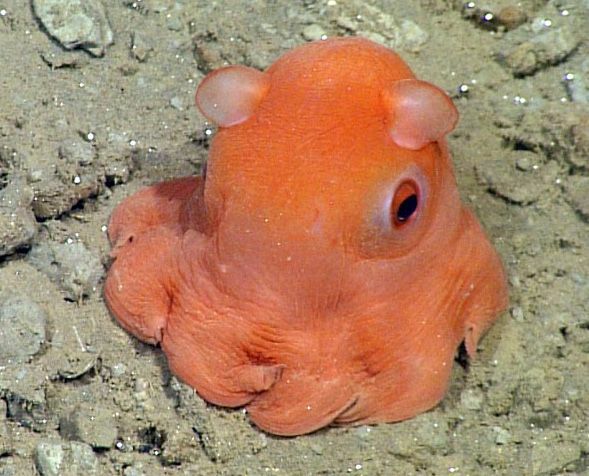 The flapjack octopus is so ‘cute and adorable’ that the scientists initially wanted to give it the specific name adorabilis.